Some of the winter-issue decorating magazines were shouting, “Oriental rugs are back!” And, if they didn’t exactly say that, at least they finally were showing a lot of them. Well, let me tell those editors one thing. 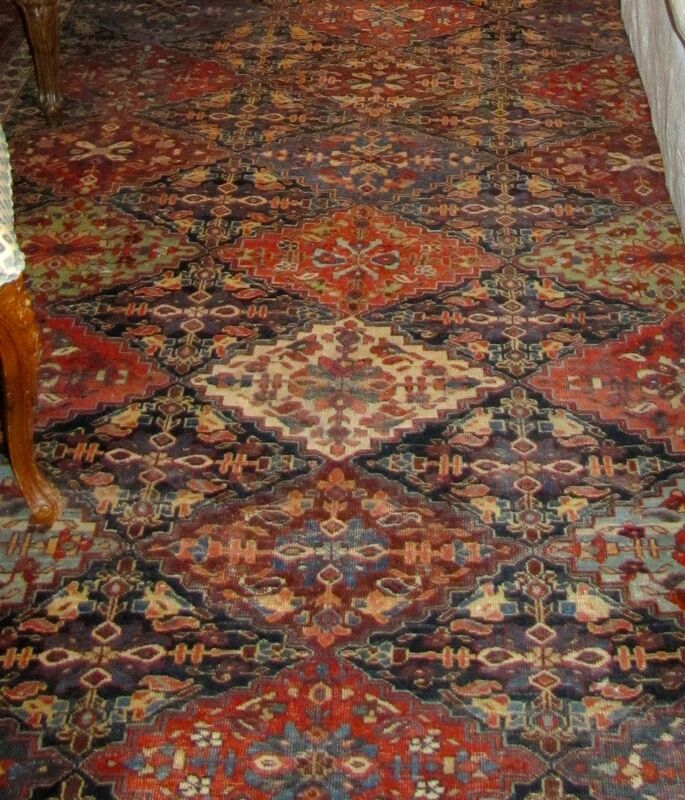 Oriental rugs never went out, not here in the South. You see, we Southerners don’t actually buy our big old Oriental rugs. Not if we can help it. We beg, borrow, and plead for them from down-sizing parents and such. And if you have priced real wool “new” carpet lately, you are probably looking for a loaner yourself. 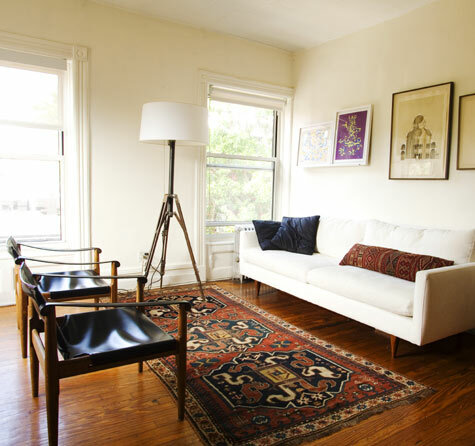 But, our older rugs’ drawback, from a decorating standpoint, is a big one. In fact, huge. Especially in the wrong hands. They are very bossy. By that, I mean that they boss around just about every other decorating decision you are going to have to make in your room. And, because it is terribly difficult to find upholstery fabric to stand up to them. Now, in the living room it is not as hard. Because we’re going to get you a handsome velvet solid from Duralee, 62 colors to select from, to cover your sofa, and you’re going to be fine at around $66 a yard. (That is very reasonable for custom yardage, trust me.) But, in the family room, it is just about impossible to find something reasonably that is heavy enough. That means heavy enough weight-wise to stand up to traffic, and also heavy enough visually to hold its own with the Oriental rug. And, while I am fine from a professional standpoint ignoring someone’s hideous pinky-beige-carpet-that-came-with-the-house that they’re replacing, I am not going to be able to ignore your Oriental rug as we begin to move forward in the room. Because it is staying. Forever. As a design professional, I have access to trade-only showrooms with thousands and thousands of fabric choices. But, I have learned that your big old free rug is one of the hardest things to work with, especially if your budget is on the strict side. Those yummy Kravet Couture or Schumacher cut-velvet geometrics that are so divine-looking, and so perfect with your big rug, retail upwards of $200 a yard. Maybe even $400 a yard. That yardage is only enough for a toss pillow or two, so we aren’t really getting anywhere. Or are we? The Color Calling solution: find a heavy cotton or heavy cotton/linen/rayon blend that looks great with the rug coloration, in a solid color for the new sofa. Then, we’ll use part of our decorating budget to buy just enough of the killer geometric for two pillows! Maximum impact, minimum expenditure. Just the way I like to work when my clients are on a tight budget. This entry was posted on February 22, 2012 by Ellen at Color Calling. 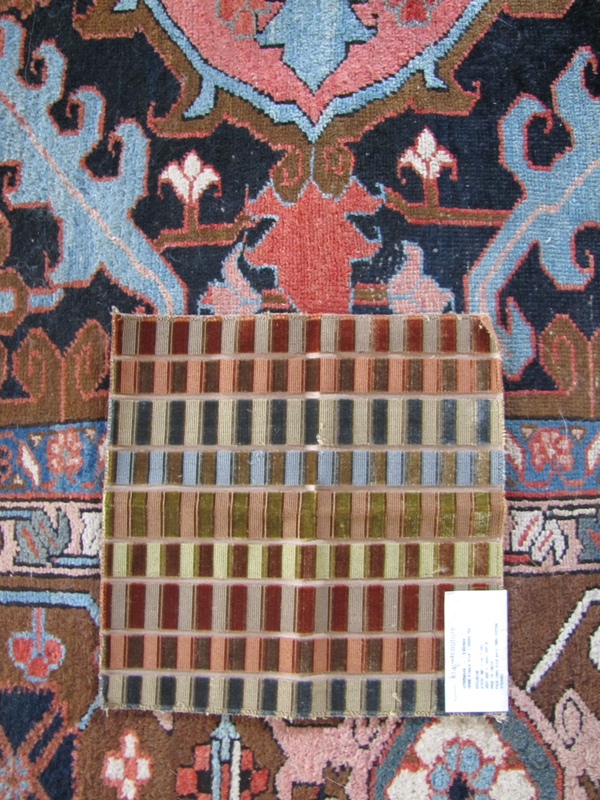 It was filed under Oriental rugs, Residential styling and was tagged with Oriental rugs. I would actually love to work a room around that rug, as I have a sofa in a coral fabric, a cream wing chair with a coral embroidered pillow. touches of blue and white freshen the room! Yes, thank you for the comment, Karena. Artists always know how to balance the weight of a room’s colors because they do it every day with a canvas! Same theory, different dimensions.